We didn't get to see too much of Chongqing. We arrived after dark and it was raining. Chongqing is a huge city. So big, in fact, that it is now its own province. It is built in the mountains and most of the buildings are built into the mountainsides. The roads, of course, are very steep and, instead of bicycles, we saw lots of motorbikes. The city is dominated by rivers. It is here that the Yangtze River joins up with its largest tributary. It is a very large tourist city and the riverside is crowded with buildings that are brightly light up at night. Our arrival at the pier was quite interesting. It was very dark and there were really no lights. We are introduced to what we will find all along the Yangtze: well worn concrete steps with no handrails. Here we have about 50 steps to get down, in the dark, in the rain, with our carry on luggage. Ship staff is strategically located along the stair case to offer a helping hand and, if necessary, to pass our carry ons from one to another. We arrive on the pier, finally, and are directed to our cabin. Our first impression of the ship and staff is very positive. I have to admit I didn't do a tremendous amount of research for this trip. I knew that the only free time we would have would be in Beijing and Shanghai so I researched those two cities before we left by reading Beijing & Shanghai by Eyewitness Travel. So I have to admit I was totally unprepared for the bathroom situation in museums and restaurants that we visited. Oh, yes....I had my personal stash of toilet paper. I never travel without a bunch of sheets tucked into a snack sized ziploc bag. That wasn't the issue. As us ladies entered the bathrooms, we had to decide whether or not we wanted a Western toilet or an Asian toilet. What's a Western toilet? Easy. If you live in a developed country, go into your bathroom. That's a Western toilet and what we had in all of our hotels. We had a bunch of elderly women in our group and that's what they required. And many bathrooms had only stall with a Western toilet. So many of us, including myself, learned how to use an Asian toilet. Good thing I go to exercise class and have decent leg muscles. As seeing the Great Wall was for Jerry, seeing the terracotta warriors was the highlight of the trip for me. The first pit discovered was an accidental discovery by a farmer who was digging a well. Apparently, many terracotta pieces had been discovered earlier by other farmers who felt the pieces were bad luck and discarded them. This farmer, though, informed the government of his find and the rest, as they say, is history. The largest pit is Pit 1 and it is the most reconstructed. For the archeologists working on this it has been a jigsaw puzzle, putting together the pieces of soldiers and horses that have been found in the pit. To me it was an overwhelming display. Every soldier’s facial features were different. They had different clothing and different hairstyles. The only consistent feature were the feet as the ‘warriors’ were constructed bottom heavy so they would stand. The first thing that hit me as we entered the museum was the sheer volume. It is huge! The second thing that hits you is the dust from the red soil. Pit 1 is still being worked on as is Pit 2 and Pit 3. And there are suspicions that even more pits exist. I had a few surprises. One, as mentioned, is the size of the pit. I was also surprised to find out that there statues of horses. I didn’t know that and had assumed there were only the warriors. With a walkway all the way around the pit, it was easy to get multiple views and I really couldn’t get enough of it. I could have hung over the rail and stared for hours. The one negative part of this visit was the luncheon we were served. It was awful. I was hungry so stayed and ate but, in retrospect, should have left and just gone back to Pit 1 to continue to ‘absorb’ the spectacle there. In Xi'an, we stayed at a hotel in the Shangri-La chain called the Golden Flower. It is considered a luxury hotel and by Xi'an standards it probably is. But it was certainly a step down from the Beijing Westin. That being said, there really wasn't anything wrong with the hotel. The room was comfortable, with a nice firm bed. And a thermostat that actually responded to my desire to get the room temperature below 70 degrees. The breakfast buffet, while not as large as the one in Beijing, was certainly more than adequate and had several new-to-me items. Service in the buffet area was a bit below par as items on the buffet were not replenished as quickly as they should have been, nor were our coffee and tea cups kept full. That said, we were there for only one night and for one night it was OK.
Our next stop was Xi'an, flying there from Beijing. We had no problem getting through security at the Beijing airport and the wait area was pretty comfortable which was good since our flight was delayed. The Xi'an airport is about an hour outside of the city of Xi'an. When we arrived it was warm and sunny. But as we approached the city, the smog got worse and worse. Xi'an has a population about half that of Beijing but in a much smaller geographical area. Plus, they have no subway and, therefore, the main means of transportation is a car. That means smog and that means lots of traffic. Because of the traffic we did not make it to our hotel first but had to go directly to the theater for the dinner and show. Because we arrived late, our dinner was rushed but the food was very good. And the show? FANTASTIC! Beautiful costumes and staging. It was like a Las Vegas show and even more. It really was worth the 'price of admission'. The rules for flying within China are unlike rules we've experienced anywhere else. Per our pretrip literature, we were instructed that we could have only one carry each and that carry on could not weigh more than 11 lbs. This sent my husband into a panic as his camera equipment weighs more than that and, obviously, he wanted to carry it all on. After some discussion, he decided there were one or two items that could go into the checked luggage. So after much playing around with his equipment while home, and weighing and reweighing his bag, he felt confident he had things under control. And then we get to China and our first internal flight. Per our guide, David, there is NO limit on carry ons AND they don't weigh them. He said he's never seen a carry on weighed. BUT, there are two important things we need to be aware of. 1) NO liquids of ANY kind in our carry on...and that includes the little travel sizes allowed in the U.S.
2) NO batteries in the checked luggage. So all extra batteries, flashlights, etc now go into our carry on. So much for our research and for being prepared. Oh, well....no biggie....at least nothing like our Antarctica trip. Our next stop was a silk rug factory. Many of the world travelers in our group had already had this type of experience but for us it was a new one and I found it very interesting. We saw rugs being made and had a small lesson on quality. Silk thread being used as the base, versus cotton, made the rug more expensive. Add to that the number of threads/knots per inch and the detail in the design...such as the rug in this video....and you end up with an expensive piece meant to be used as a wall hanging. Our morning was a rickshaw tour of a Beijing hutong. Hutongs are the old typical neighborhoods of Beijing. At one time, all of Beijing looked this way but then the developers came in with bulldozers and the hutongs fell one by one. Finally, it was realized that a very important part of old Beijing was being destroyed and the remaining hutongs were protected from development. 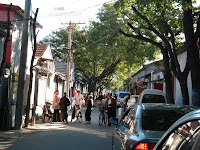 A hutong is kind of a city within a city. From the main streets, a hutong is entered through a gateway into one of many alleys. Off of these alleys are gateways to courtyards. And around the courtyards are the rooms and apartments where the residents live. Our visit included seeing a 'typical' hutong apartment. We certainly enjoyed our visit and the hostess was delightful but the fact is there was nothing typical about this apartment, which is why I have not included any photos. For one, we entered off of the alley of the apartment instead of coming in through a courtyard. At the opposite end of the apartment we could see the doorway that exited through the courtyard but we did not use that doorway. The reason given was that when the 'lady' decided to open her home to foreign visitors, she didn't want to disturb her neighbors in the courtyard and so opened her apartment to the alleyway. Plus, by current standards, her apartment was very large for one person. In the past, she had lived there with her mother and brother. Her brother moved on. Her mother died. She now lives there alone, with her poodle, and has taken down the walls which divided the apartment into several small rooms. Our hostess was a retired government worker and there is no doubt that her standard of living was higher than others in the hutong. That aside, we were able to ask questions which 'the lady' graciously answered in Chinese for our guide to interpret. 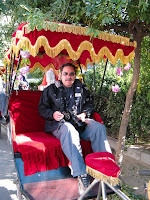 After enjoying a cup of tea, we reboarded our rickshaws for the rest of our tour. Our final stop for the day was the Sacred Way of the Ming Tombs. 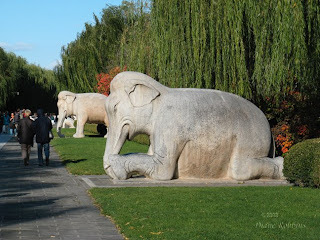 This is a beautiful walk through willow trees, with the walk lined with bigger than life size statues of military officers and animals. Each statue had a match on the other side of the walkway. And what was interesting about the animals is that there were actually four of each...two the same standing and two the same lying down. That way the pathway was always guarded since there was a pair to 'watch' while the other pair rested. Lunch today was at a jade exchange. Again served lazy susan style, it was pretty much thrown at us since they, of course, wanted us on the selling floor as soon as possible. At least the food was tasty. The selling floor was HUGE! And it was like wandering through a jade museum. Which I absolutely loved doing. I had no plans on buying anything and didn't see anything I had to have. But a lot of the pieces were absolutely stunning and I just enjoyed wandering and admiring. Wish I had packed a suitcase within a suitcase. If I had only known how cheap stuff really is in China....I would have definitely come back with a lot more than I did...so maybe it's just as well....what would I do with all of it? But seriously, shopping in China is serious business. There are two very important things to know. The first is that it is standard to bargain and to bargain hard. And the other is to make sure it doesn't look like you've fallen in love with that piece of jade or porcelain or silk. If you want to get a good price, you need to be willing to walk away. And I mean that literally. We discovered two methods that worked very well for us. One was a showing of total disinterest on my part. If I couldn't get it for the price I wanted to pay, I walked away and chatted with my husband, or another person in our tour group, showing no interest at all in the item, or any other item. And each time the salesperson came to me and agreed to my last offer. The second way was my husband looking annoyed, as the bargaining went on, and saying sternly 'Let's go!'. That usually got an 'OK, OK.' from the salesperson. And the most interesting part? Where the 'bidding' started. The salesperson would quote a ridiculously high amount, either in English, or on a piece of paper or punched into a calculator. I countered at about 20% of that number. I usually got an immediate brush off. So I'd turn away and then there would be a tap on my shoulder with the calculator, or pen and pencil, handed to me. So I'd go up a little, they'd come down a little, until finally I reached the maximum I wanted to pay and then I'd get stubborn. In the end, I usually made the purchase for anywhere from 60-75% below the starting price.